I feel the need… The need for speed!!! Long before Tom Cruise coined this phrase in the movie “Top Gun”, The United States of America, her intelligence agencies, the Department of Defense, and Lockheed’s Advance Development Projects Dept. (The Skunk Works), led by Clarence “Kelly “ Johnson, where feeling, and thinking the same exact thing. Rather than ramble on with all the dates, stats, and facts that any one that has ever heard about the Blackbird would already know, I’ll just mention a few points of interest. The SR-71A cruising at a speed of Mach 3 plus, can fly over, survey, and photograph 100,000 square miles in approximately 1 hour, from an altitude of over 80,000 ft.
From the ground, you’d never see it, or hear it… Talk about candid camera! In over 25 years of operation, the SR-71 has flown over, and, or around every major hot spot in the world, especially where American interests were involved, and despite being fired at many times (approximately 4000 times according to some reports), and numerous attempts to intercept it, not one has ever been shot down. Since its development, acceptance, and deployment, the A-12, YF-12A, M-21, D-21 Drone, and SR-71 Blackbird family have been the stuff of dreams. Some of their accomplishments and records are still unmatched, and, or unbroken to this day. The exact number built, is still known only to a very few, and even more so, the full history, and its full capabilities are still shrouded in secrecy. We can only hope some day, we will be able to read about them, in their entirety, which I’m sure would make for some very interesting reading. For as long as the aircraft has been around, you can still easily count all the major versions. I had to stick to the most prevalent aircraft, being that money, and display space were a major consideration. The main kits I needed were all fairly easy to find when I started collecting them about 8 years ago. It’s getting just a little harder to find them now. 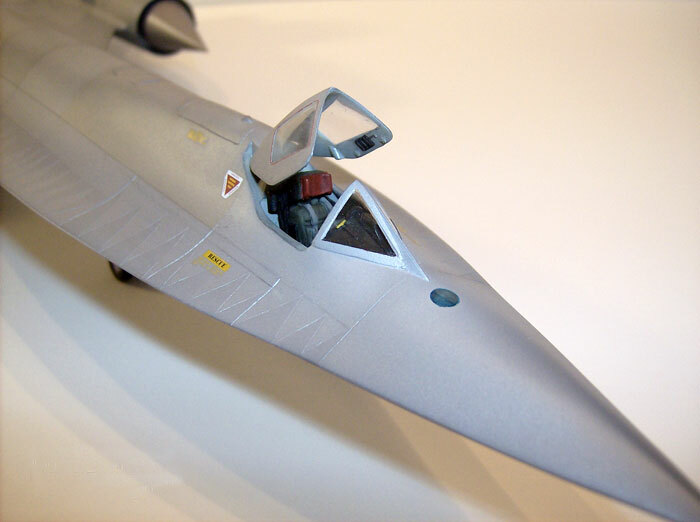 Testor makes the two main kits in 1/48th scale, the SR-71, and the YF-12. Kiwi Resins made the necessary conversions for the other versions. Just in case reading this gets confusing, I listed the aircraft in their respective order of appearance, or manufacture, not in the order I built them, and noted this in the article. The A-12 was actually the first aircraft in the family. Initially requested by, and developed for the CIA. 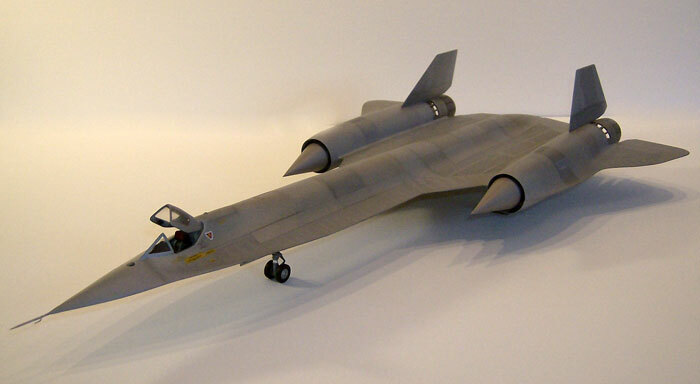 The A-12 was to be a high altitude, high speed, replacement for the U-2. Built as a single seat, high-speed reconnaissance aircraft, also proving many of Kelly Johnson’s theories, and concepts. This aircraft was flying operation missions for approximately 2 years before news was broke to the public of the SR-71. This turned out to be the number 3 build in my project. 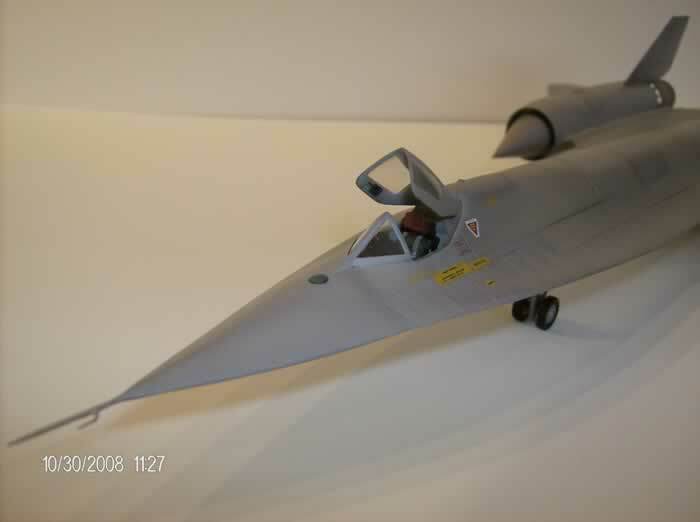 While gathering all the kits and references for this huge project, I had read Paul Boyers article in Fine Scale Modeler (Dec. 2003), about how he had backdated a1/72 scale Italeri SR-71 to an A-12. I figured on doing the same thing, only in 1/48th scale. 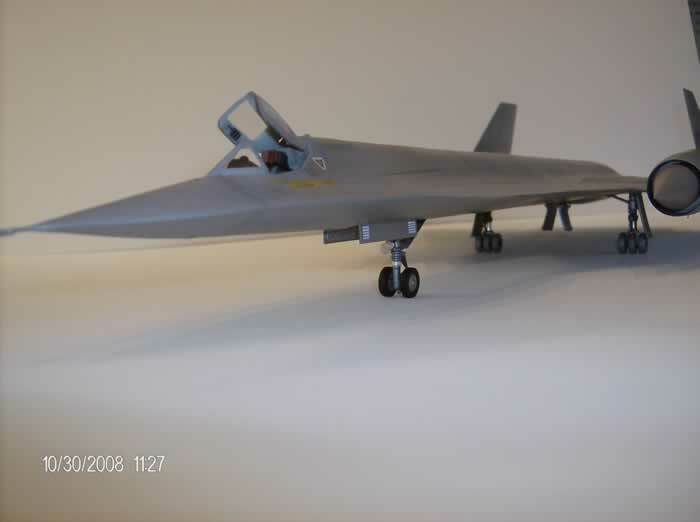 I had already purchased the first two kits, Testor’s SR-71 and YF-12 to swap the parts needed, but then while chatting on the Hyper-scale Forum, some of our faithful readers mentioned the conversion set from Kiwi Resin Models. They sent me the web site, (Thank you Max Bryant, and Phil “Bondo” Brandt) I did some searching, and I ordered two sets. One is for the A-12; the other is going on my M-12, but more on that version later. 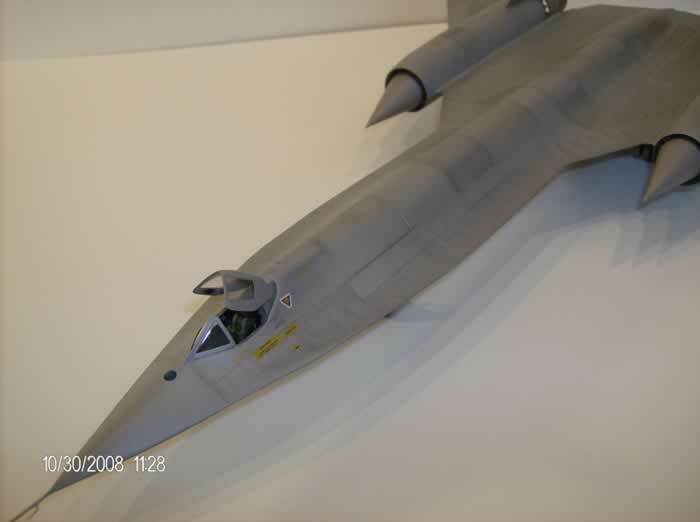 Dave Lochead of Kiwi Resin Models did a great job of making the conversion kit for the A-12. Every thing is included in the set to convert an SR-71 to an A-12, and also includes a new cockpit. It’s easy to see how some of the original kit parts were modified, and used as the masters for his conversion. Being as such, the parts fit very well after a little clean up. 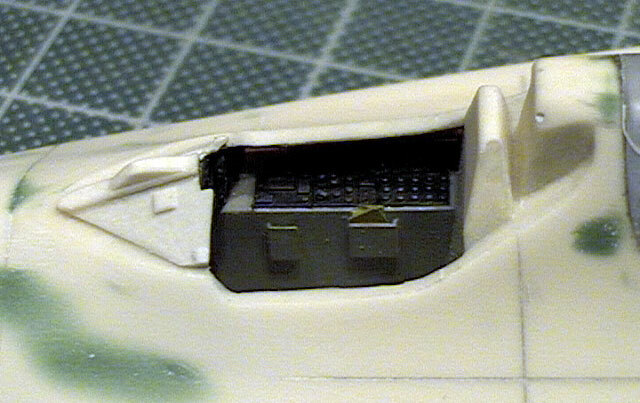 The new parts have recessed panel lines, which I liked, being I was going to re-scribe most of the original kit any way. It was definitely easier using the conversion set, than all the cutting, sanding, and filling I’d have to do going the other route. 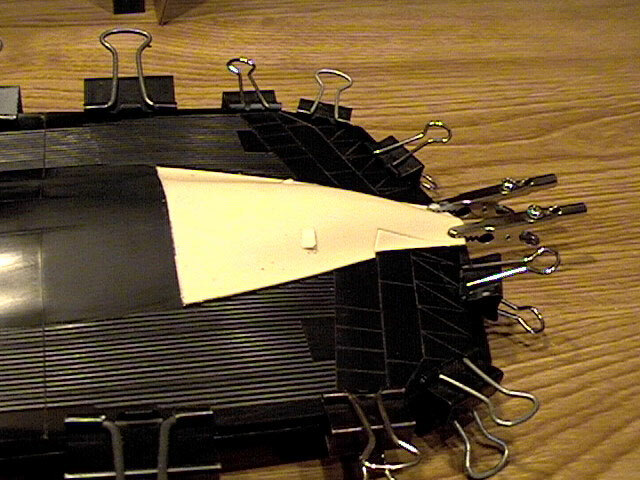 All the conversion parts were added, and re-enforced on the insides with plastic strip, and lots of super glue. My references also show the top and bottom Q-bay hatches, which I scribed in. This is where all the reconnaissance cameras and electronics, Elint, and Sigint electronics are carried. It is also where the second cockpit was to be incorporated later on the M-21, YF-12, and SR-71. I added a small camera fairing on the top ‘Q-bay’ hatch. 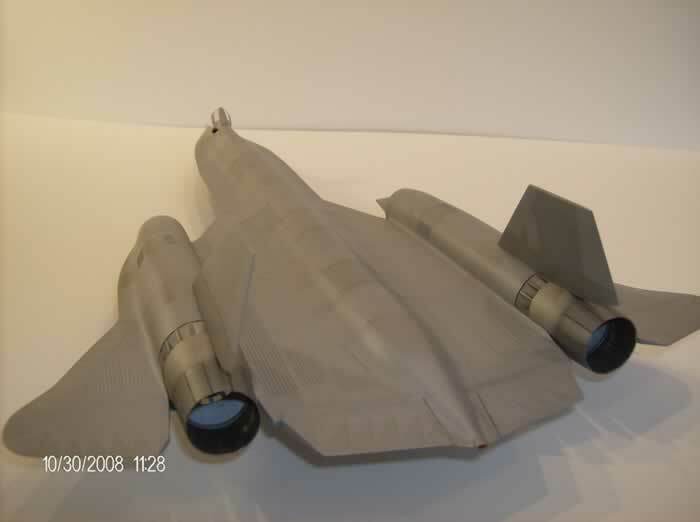 The A-12 had a rear-facing camera that, when the radar warning receivers picked up any threats, the camera would take one picture at one-second intervals till the threat was over, these pictures were then used for later analysis. In all the reading I was doing during this project, I had also learned that the first couple of A-12s had more of the ‘pie shaped’ wedges along the fuselage chines. I really wanted to show them here too, so, out came the scribing tool once again, and after a little more sweating, fumbling, and a little strong verbal coercion, I have the wedges. A new sun/celestial compass and drift sight was fashioned from clear acrylic stock. Holes were drilled out for them, one just forward of the windscreen, the other just a little further forward, and under the nose. The sun compass is further back on the spine of the SR-71, but was in the nose on the A-12. I also changed the landing gear a little. The kits nose tires are too large, so I sanded them down in thickness and diameter. Now for the fun part, the natural metal finish…. UUUGH!!! 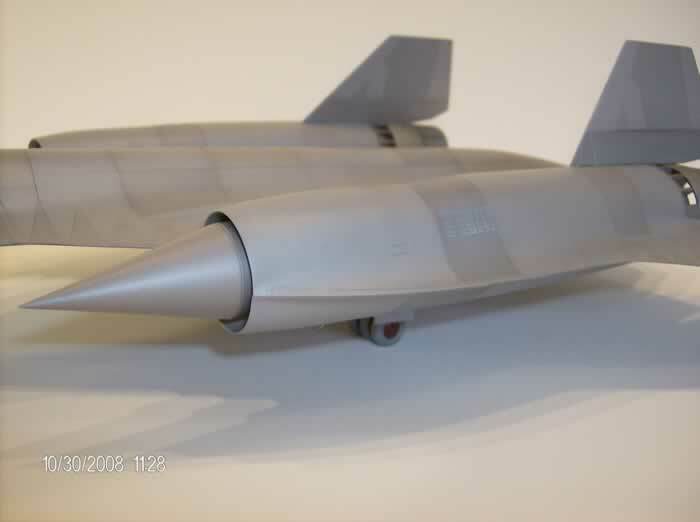 Being that the A-12 was built primarily of Titanium, which is said to have a slight orange hue, I had to mix a little special color for this bird. Normally, I don’t worry too much anymore about NMF’s. I discovered a few tricks that have helped me achieve what I think are some very nice results. I find that if you mix your silver, aluminum, chrome, or whatever metal colors your using, with a little flat gray, or white, they dry better, and aren’t as tacky as they dry. Naturally with this aircraft I had to mix in a little orange along with my grays and whites. I varied the amounts to give a more varied look. No one likes a boring solid, monotone bare metal aircraft, and judging from my pictures, the A-12 was anything but monotone. All the wedges were also masked, (Yes, I’m expected to make a full recovery with the help of therapy) and alternately given slightly different shading. I think this further accented the wedges better than just the new panel lines alone.